If the toddler years are known for anything, it’s for being a time of great discovery. Everything is new and every day is a new education. And one of the cornerstones of that education is learning how to put the world around them into words. Watching a child’s vocabulary grow is one of the most satisfying aspects of being a parent. It can however also be a very challenging time. Toddlers tend to understand a lot more than they can say. And this can be frustrating for both you and your child. If you’d like to help your toddler in their language learning journey, here are eight simple tips for doing just that. The easiest way to kick start your child’s language development is to simply talk to them more. Your child is learning on a near constant basis and the more you talk to them during everyday activities, the more words they’re going to pick up. Try to get into the habit of giving your child a running commentary of what you are doing, where you are going etc. In today’s fast paced world, most of us have a tendency to communicate at breakneck speed. In most situations, there’s nothing wrong with this. When talking to a toddler however, it can easily turn an easy conversation into one that they will struggle with. While it can certainly take a bit of practice, try to slow your speech. Your words, while familiar to you, are new to your child. Speaking slowly and clearly is therefore vital. When talking to your toddler, try to keep in mind that to them, you’re just one of many distractions. Everything is new, and as a result, everything is distracting. If you want your child to pay attention to you (and therefore learn from you), it’s important to get down to their level. Rather than throwing words at them without looking, make eye contact and where possible, kneel down to minimise the distance between you both. When your child gets a word wrong, it’s important to realise that there’s a fine line between correction and criticism. And if you want your child to grow confident in their language abilities, it’s important that you avoid the latter. Never tell your child that they’ve said something wrong. Instead, simply repeat what they’ve said back to them with the words corrected. Your child will understand their mistake without you having to tell them. According to the American Academy of Paediatrics, children’s TV time should be limited to two hours max per day. While it might seem like educational programming could help your child’s language abilities, the reality is that because television doesn’t actually interact with your child, it’s largely ineffective for language learning purposes. In other words, it’ll never be a substitute for human conversations. Choose story topics that your toddler genuinely enjoys. Elaborate on objects/characters that your toddler shows interest in. Stop and talk about the story. Another easy way to help your child grasp new words is to simply ask them plenty of questions. When chosen correctly, questions can help your child to differentiate between different words and phrases. Questions that require a choice are best such as “would you like an apple or a banana?”. In doing so, you are making your child really think about the words involved. Finally, while there’s no denying the importance of numbers, shapes, and colours, don’t obsess over them. What’s important now is that your child learns to communicate their wants and needs. Everything else can, and should, come after this. Rather than counting things, describe them. Rather than pointing out colours, point out objects. Your child will pick up a much richer vocabulary as a result. The author of this post is Emma Dawson, an employee at Board Book Albums, a leading designer of kids photo albums. Emma loves photography and sketching. 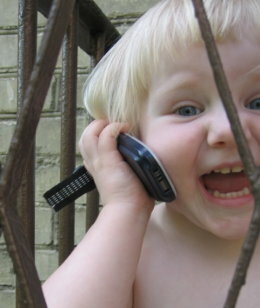 Eight Language Development Tips For Parents Of Toddlers was posted in Learning by Guest Author.